The combination of beer and cheese is no novel concept. In Belgium it is common practice for bars to serve small cubes of cheese sprinkled with celery salt. And what goes better with pizza or nachos than a humble pint of lager? Cheese and beer share many earthy, pungent flavours that wine does not possess. I like to look for similar characteristics between the beer in question and the cheese it is matched with. I’ve described a few of my favorite pairings to give you an idea of what to look for. Fruit lambics are known to have a distinct sourness that pairs extremely well with a soft goat cheese like chêvre. Wheat beers are also an appropriate pairing for chêvre and feta, but the spicy clove notes also bring out the nutty complexities of Gruyère. Wheat and lambic beers will also go well with sweet cheeses such as ricotta and mascarpone, which are often used in desserts. Crisp lagers will cut through a particularly salty or high-fat cheese. Think of how well a crisp Pilsner goes with your favorite pepperoni pizza – in all of its greasy, salty glory. Oak aged beers such as Innis & Gunn, and many varieties of barley wine, tend to have notes of vanilla and caramel that accentuate a buttery brie or camembert. When you’re pairing cheese with a particularly hoppy India Pale Ale, the sharpness of the cheese should match the strength of the hops. Extra-old white cheddar, aged 2 years or more, can easily hold its own against a heavily-hopped Double IPA. Mix and match. Break the "rules"
The smoked malt used in Porter makes it a natural match for smoked cheeses, while Jarlsberg, Emmental, and other Swiss-style cheeses are also good selections. A jet black stout is probably the best pairing for a pungent blue stilton or Roquefort. A more subtle blue-mold cheese such as Gorgonzola could yet withstand the high-alcohol content Belgian dubbel or tripel. In the words of Katharine Hepburn, “If you obey all the rules you miss all the fun.” There will be noticeable differences between beers of any given style, which may allow for some unique pairing combinations. Start with the lighter-bodied beers (wheat beer, pilsner) and work your way towards the more full-bodied varieties (porter, stout). Don’t get too caught up with what “goes” together – there a pretentious beer geek can be an even worse dinner guest than a wine snob. Try something new, and make up your own mind about what to pair with it. 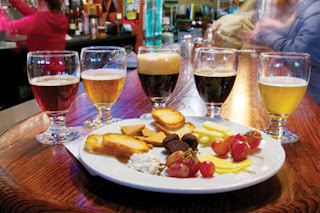 Have your own beer and cheese tasting party and get your guests talking about which combination they enjoy the most. The conversation may provoke some interesting chemistry, and not just between the food and drink. It’s taken me a while to perfect this classic comfort food. Bacon takes it to the next level of awesome. Be sure to use a beer that’s not too hoppy to contrast with the sharp cheddar. A creamy stout or a rich red ale with a hint of malty sweetness. Sorry kids, this one's for the grown-ups. 1. Cook pasta in a large pot of salted boiling water according to package directions. 2. Melt butter in a smaller saucepan. 3. Whisk flour into butter to form a roux. Cook for 2 minutes until golden in color. 4. Gradually pour beer into the roux and whisk to combine. 5. Add milk, mustard, Worcestershire sauce, salt and pepper and whisk vigorously. 6. Continue to cook, whisking occasionally until sauce begins to thicken, about 5-10 minutes. 7. When sauce has thickened, add shredded cheese and whisk to combine. Sauce will still be a little runny, but will thicken when baked. 8. Drain pasta and return to pot. 9. Pour cheese sauce over the pasta and stir to coat. 10. You now have a couple options. Choose wisely. - Toast panko for 5-10 minutes in oven at 300°F. - Continue to cook pasta in sauce over medium heat for 4-5 minutes until a creamy consistency is reached. - Top pasta with toasted panko crumbs. Eat right out of the pot. - Transfer to a large open casserole dish and top with panko bread crumbs. - Bake for 25-30 minutes until panko is a crisp golden brown. This method takes more patience, but the crispy topping is worth it. - Crumble 8-10 slices of cooked bacon and fold it in with the cheese sauce. - Transfer to a large open casserole dish and top with panko bread crumbs and more crumbled bacon. 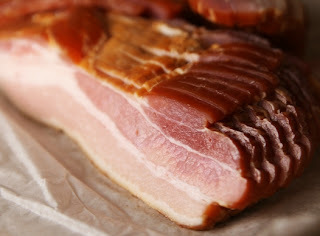 - Bake for 25-30 minutes until panko and bacon topping is crispy.